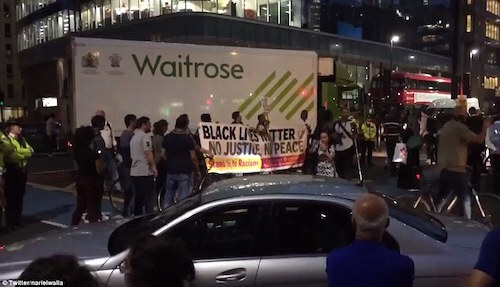 Black Lives Matter protesters intent on causing chaos in London blocked in a Waitrose lorry as they chanted ‘hands up, don’t shoot’ at police officers – who were not carrying guns. The group of so-far peaceful demonstrators marched through east London and stopped traffic in Whitechapel and Shoreditch, frustrating revelers heading to the trendy area for a Friday night out. Placard-waving activists in Manchester also brought trams and traffic to a halt outside Piccadilly bus station. It followed a wave of protests this morning which saw protesters from the Black Lives Matter group bring transport routes to a standstill by laying [sic] down on motorways, blocking the entrances to airports and stopping trams. 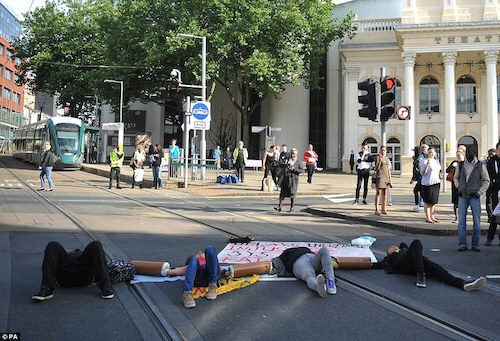 Earlier today, activists chained themselves together and stood across approach roads to Heathrow and Birmingham airports, while in the centre of Nottingham, four protesters lay across tram tracks. … In Birmingham, an ambulance was delayed as paramedics tried to get a patient to Heartlands Hospital along the blocked A45. 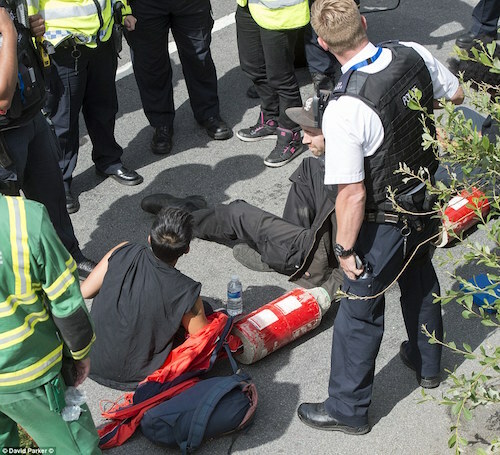 The protests were evidently coordinated across the U.K., and the protesters used relatively high-tech methods requiring considerable planning, such as chaining themselves together with concrete locks, which required the police to use power tools to cut them open in order to separate the protesters–and, one hopes, put them under arrest. It would be interesting to know who organized and paid for the demonstrations, but so far I have seen no information on that. Yesterday was the fifth anniversary of Mark Duggan being shot dead by police in Tottenham, North London, which prompted widespread protests across the capital and in other cities across Britain between August 6 and 11, 2011. 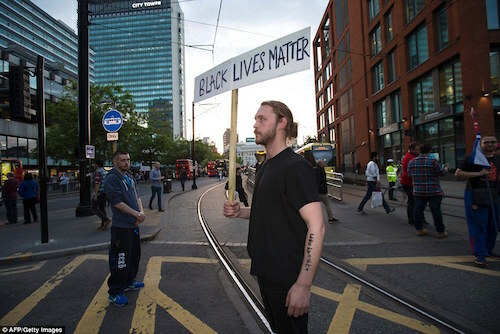 Black Lives Matter said it wanted to commemorate the fifth anniversary of Mr Duggan’s death. While no gun was found on him, a handgun in a sock was discovered on grassland about four metres (14ft) from his body. … The IPCC said the most “plausible” explanation for the location of the gun was that Duggan “was in the process of throwing it to his right as he was shot”. Its president, Malia Bouattia, praised the ‘brave’ demonstrators who stopped people getting to Heathrow Airport this morning. 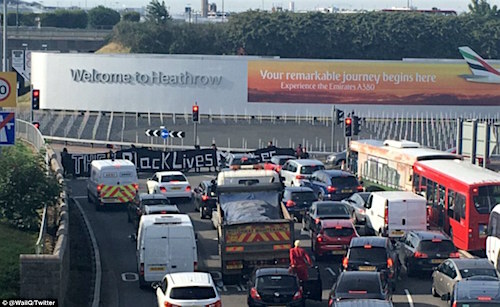 ‘I extend my solidarity and respect to the Black Lives Matter protesters who have bravely blocked the M4 outside Heathrow Airport this morning and others who have held demonstrations across the UK,’ she said. ‘We have reached a crisis point where we have been forced into taking direct action and it’s obvious there is a desperate need for a Black Lives Matter movement in the UK. Obvious or not, it isn’t hard to guess what most Britons will make of a coordinated series of demonstrations that mostly involve blocking highways and tramways. It is hard to imagine how the protesters thought this would be a good idea. If I knew who organized and paid for the demonstrations, I would ask him.